To learn about text giving, click here. Thank you for supporting the mission and ministries of Harvest Bible Church. Please bear in mind that when using electronic giving, the church is assessed a fee. These fees are removed from the donation before we receive them. Credit and debit cards carry a fixed fee in addition to a minimum of 2.75% of the amount given. Another convenient option is to use a checking or savings account and the only fee assessed to the church is $0.25 per transaction. You can make a one-time or recurring donations for tithes/offerings, the building fund, missions, children's and or student ministries. You will also be able to look up your electronic giving history. Click the Go to Secure Giving button below. If you’ve already created a profile, please Log In, otherwise click Create Profile. If you only want to make a one-time donation, you may continue without creating a profile. If you think you may give again, creating a profile will speed up future giving. Follow the instructions to setup your preferred method of electronic giving. If you have created a profile, you may also opt-in to text giving which will use the method of giving you have chosen. If you have any questions or concerns, please don't hesitate to contact the church office. Those wishing to give electronically might also consider giving through online bill payment at your bank. Most banks do not charge for this service, and there are no fees for the church. You tell your bank how much to send and they cut and mail Harvest Bible Church a check. If they ask you for an account or provide a memo line, simply put which fund you want your donation to be allocated. Works with any text message capable phone. Go to secure giving & create a giving profile. 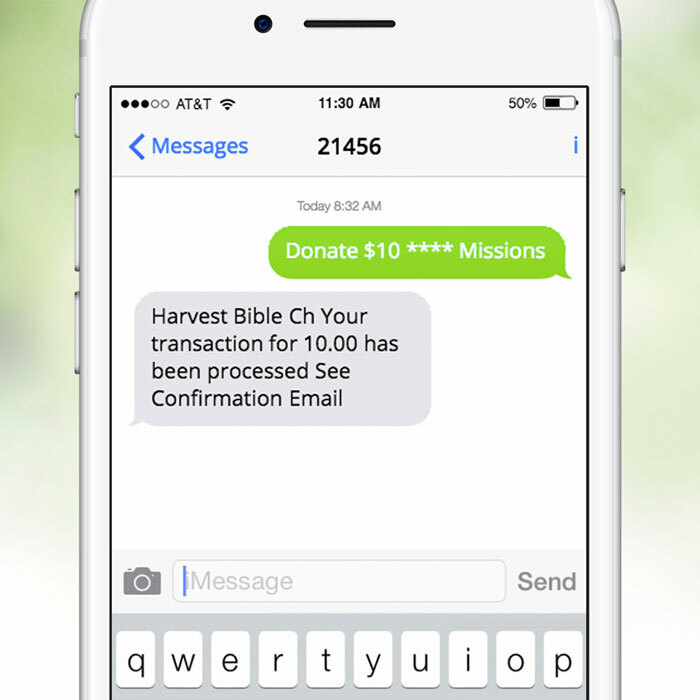 Opt-In to text giving in your profile. Choose a payments source, create a 4 digit pin and select your phone carrier. Send a text message to "21456" with "Donate Amount Pin Designation". Standard text message charges may apply from your wireless provider, depending on your text message plan. After clicking the Give Now button, either log in to your profile or create a profile if you haven't done so yet.